The concept of “cover records” has played a role in the music industry for over a hundred years. A cover record, or a cover for short, is a new recording of a commercially released song by a performer other than the original artist. Under the Copyright Act passed by Congress in 1909, American musicians have the right to record a version of a previously recorded tune by another artist. A composer has the right to decide who will be the first to record his song, but once it has been released to the public, any performer can create a new version. Each artist can negotiate an agreement with the writer (as Colonel Parker often did on Elvis’s behalf). More commonly, though, a performer records the song under what’s called a “mechanical license,” which pays a standard royalty to the copyright holder through an intermediate company. Covers of recordings on LPs troubled neither composers nor original artists in the fifties, but when a cover version was released as a single hot on the heels of the original artist’s single, the stakes increased dramatically. Radio play and Billboard rankings could be affected, and artists’ careers could be damaged, even ruined. A theatrical example appeared in Presley’s 1957 film Jailhouse Rock. A recording of “Don’t Leave Me Now” by beginning artist Vince Everett, Elvis’s character, was offered to Geneva Records, a major label. When a label executive rejected the recording, Vince and his manager put the record out on their fledgling label, Deltona Records, only to see sales disappear when Geneva released a cover version by one of its established singers. “They stole my arrangement, my style, everything,” Vince lamented. Such shady tactics were played out often for real in the recording industry in the 1950s. One of the first examples occurred in 1954, when LaVern Baker’s recording of “Tweedle Dee” hit Billboard’s Top 100 singles chart. Baker had toiled for a decade on the rhythm and blues charts before the advent of rock ’n’ roll rewarded her with a crossover hit on the more lucrative pop charts. Sales stalled on her recording of “Tweedle Dee,” however, when Mercury Records put out a quick cover record by white singer Georgia Gibbs. Atlantic, Baker’s label, couldn’t compete with Mercury’s promotion and distribution system, and the result was that Gibbs’s cover out performed Baker’s original on the charts and in stores. Fats Domino was one of the black singers whose r&b style found acceptance on the pop charts in the early rock ’n’ roll years. By the end of 1956, Domino had written and recorded 35 songs, 13 of which were covered by big label white singers, including Theresa Brewer and Pat Boone. All 13 covers sold more copies than Domino’s original records. 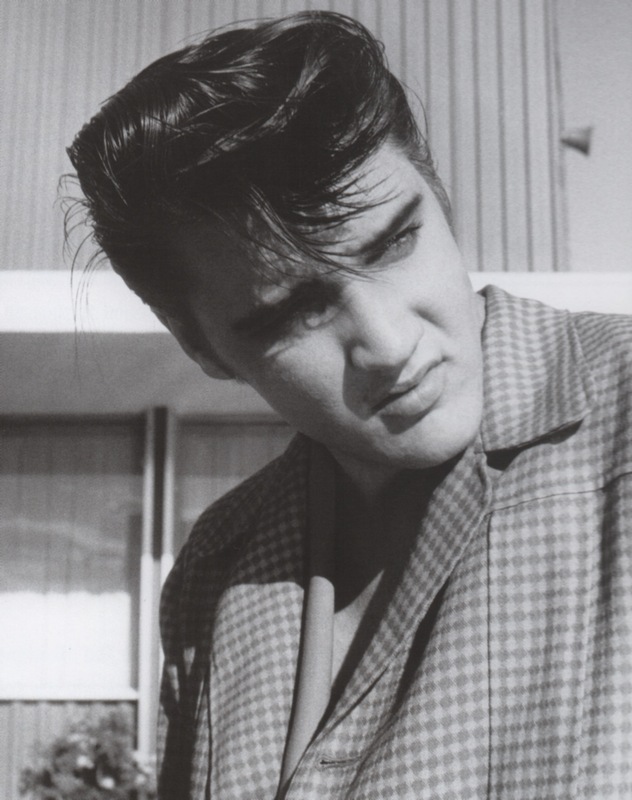 How, then, did Elvis Presley fit into the cover controversy in the fifties? Was he ever guilty of stealing sales, chart placement, and prestige from other singers by rushing out a cover version of someone else’s current hit? A close look at Presley’s single releases in the fifties provides some answers. First of all, Elvis’s five single releases for Sun Records in 1954 and 1955 are not relevant here. 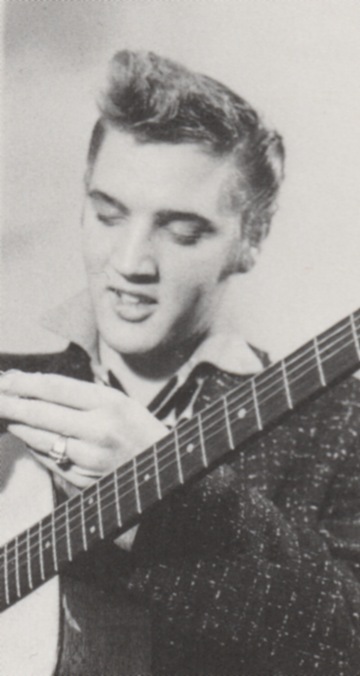 As a small, regional label, Sun lacked the power to influence national sales and chart action of other labels and their artists, particularly with a beginner like Presley. It wasn’t until Elvis began recording for RCA in 1956 that a cover record by him had the power to bury a competitor’s original recording. • Did Elvis steal the music with his cover records? Also, the several dozen songs Elvis covered to fill his LPs in the fifties had no significance in the cover controversy. His album covers of Little Richard’s songs, for instance, had no effect on the sales or chart performance of Little Richard’s original single releases. 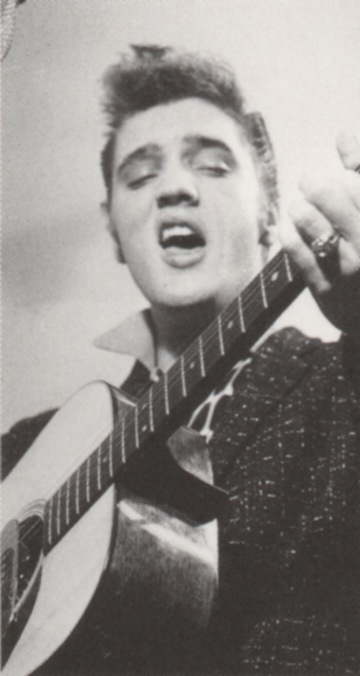 For Presley, all that is relevant to the cover controversy are his singles released by RCA during the decade. So, let’s sort them out to see which were covers and which among them, if any, might have stolen the original artists’ thunder. 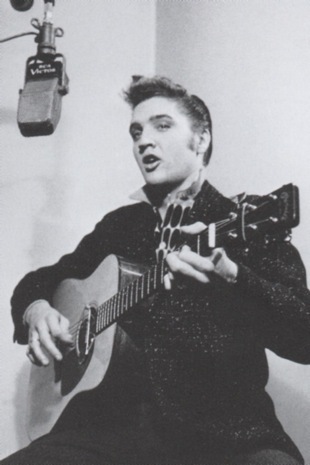 From the beginning of 1956 through the end of 1959, RCA issued 14 Elvis Presley singles, containing 28 songs. (The seven singles containing LP cuts released simultaneously as a stunt in late August 1956 are disregarded.) For 21 of those, Elvis’s was the original recording and single release. That leaves just 7 cover songs to examine to determine if Presley’s versions impeded the progress of the original releases. • “Hound Dog” — Perhaps Elvis’s most well known cover, “Hound Dog” was wildly popular in 1956 and remains one of the songs most associated with Presley today. 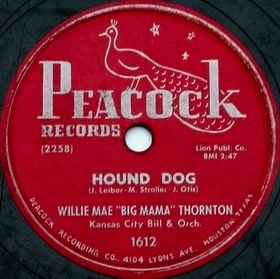 It’s widely known that the original version of the Leiber and Stoller song was a r&b hit for Willie Mae “Big Mama” Thornton in 1953, and that many others recorded it before Elvis. • “My Baby Left Me” — As the B side of Elvis’s second RCA single, “My Baby Left Me” reached only #31 on the Top 100. Arthur “Big Boy” Crudup wrote the song and recorded it in November 1950 for its original release on the RCA label. • “Too Much” — Recorded late in 1956, “Too Much” was Presley’s first chart single in 1957, climbing to #2 on the Top 100. It was written by Bernard Weinman and Lee Rosenberg and first recorded by Bernard Hardison on Republic Records in 1954. 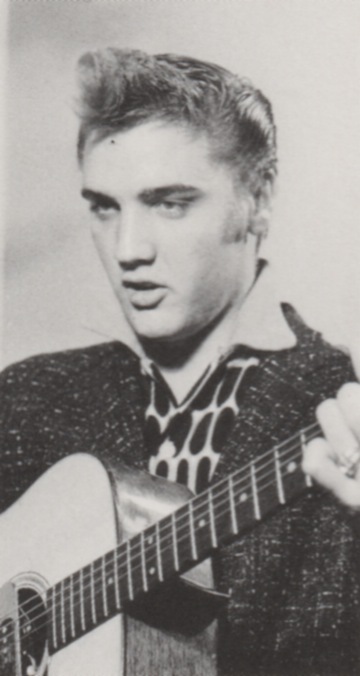 • “All Shook Up” — Most Elvis fans might be surprised to learn that Elvis was not the first artist to record “All Shook Up.” As it was written by Otis Blackwell, who had previously supplied Presley with original material, it’s easy to see why many assume Elvis’s record was the original. Actually, David Hess (stage name David Hill) was the first to record the song. 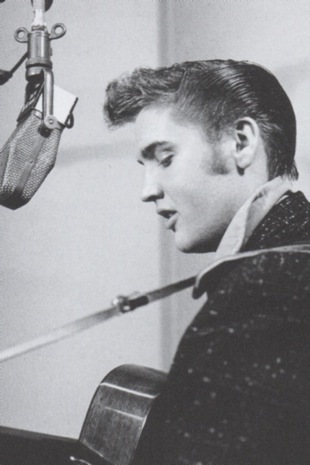 His version on Aladdin Records came out a few weeks before RCA released Elvis’s single of the song. 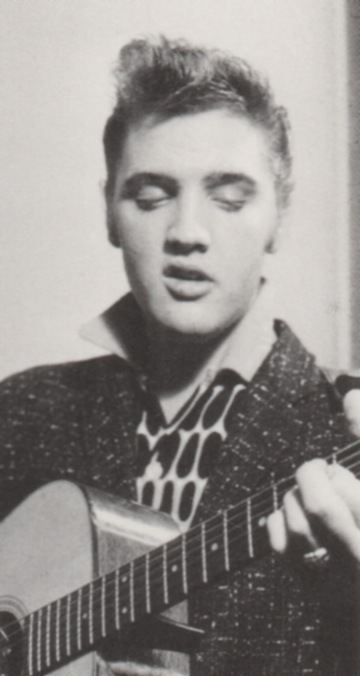 • “That When Your Heartaches Begin” — As the flip side of “All Shook Up,” it was part of the only Presley double-sided cover single in the fifties. “Heartaches” was written 30 years earlier in 1937. Perhaps the most notable recording prior to Presley’s was by the Ink Spots in 1941. • “One Night” — Elvis’s version of “One Night” reached #4 on Billboard’s Hot 100 in 1958. The song was originally written under the name “One Night of Sin,” and was first recorded by Smiley Lewis in 1956. That original recording failed to make the charts. • “A Fool Such As I” — Presley’s recording of the song written by Bill Trader in 1952 climbed to #2 on Billboard’s Hot 100 in 1959. Hank Snow’s original recording of the song reached #4 on the country charts in 1953. Before we let Elvis completely off the hook for his cover songs, it should be noted that inadvertently he may have hindered another man’s success with a cover song in early 1956. 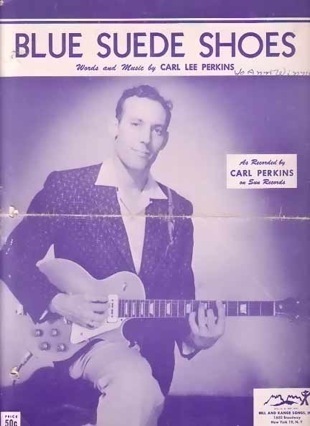 That song was “Blue Suede Shoes” and the offended singer was Elvis’s Sun Records stablemate and friend Carl Perkins. 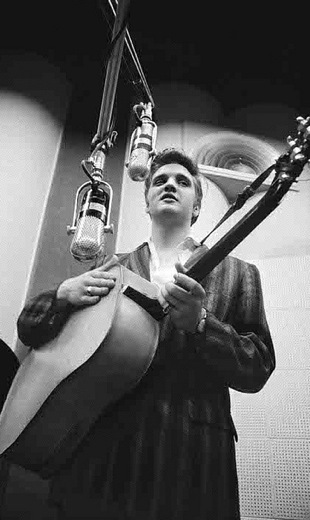 Perkins recorded his classic rock anthem at Sam Phillips’s studio in December 1955, about the same time Elvis left Sun. 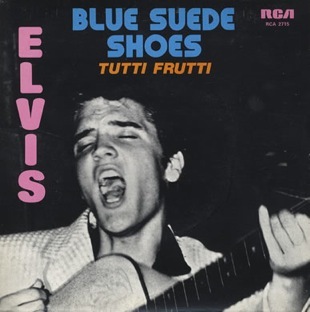 Just six weeks later and less than a month after Perkins’s record was released, Presley recorded “Blue Suede Shoes” at RCA’s studios in New York. Why he did so is in dispute. Scotty Moore has said Elvis wanted to record it as a tribute to Perkins. According to Perkins’s 1996 autobiography, Sam Phillips obtained a promise from RCA not to release Presley’s version of “Blue Suede Shoes” as a single until after Perkins’s record had run its course on the charts. Technically, RCA held to that promise. In March 1956, Perkins’s single entered the Top 100 and Presley’s cover appeared as a track on his first LP. On the Top 100, Perkins’s “Blue Suede Shoes” dueled back and forth with Presley’s “Heartbreak Hotel” as they headed up the chart together. 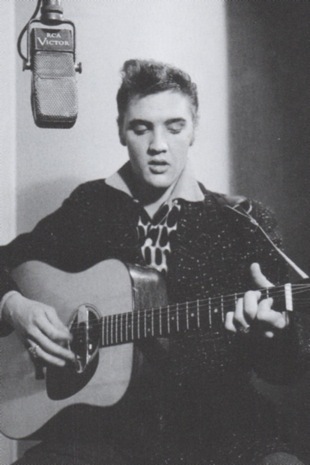 In May 1956, Elvis’s song won out, settling in at #1 for seven weeks, barring Perkins from reaching the top spot. It’s possible, however, that Elvis’s cover of “Blue Suede Shoes” kept Carl Perkins’ record from reaching #1. When RCA released Presley’s LP on March 31, 1956, it simultaneously released a Presley four-song extended play album that included “Blue Suede Shoes.” Since the EP played at 45 rpm, disc jockeys could play it on their equipment just like a single record. 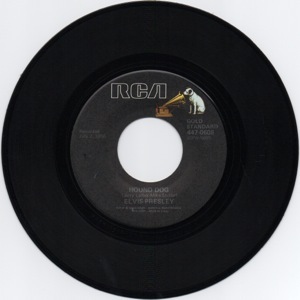 Following its standard procedure at the time, RCA sent promotional copies of the Presley EP to radio stations around the country. The result was that Elvis’s version of “Blue Suede Shoes” got enough airplay and sales to make it into Billboard’s Top 100 singles chart. When Elvis’s version entered the Top 100 on April 7, 1956, Perkins’s “Blue Suede Shoes” was at #6, ahead of Presley’s “Heartbreak Hotel” at #8. 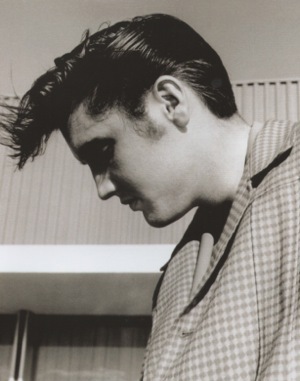 Although Elvis’s cover of “Blue Suede Shoes” eventually climbed to only #24 on the chart, it’s possible that it created enough drag on Perkins’ record in terms of airplay and sales to allow “Heartbreak Hotel” to win the race to #1. 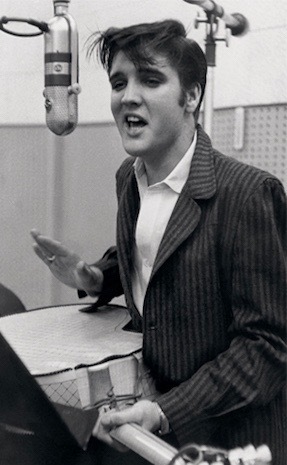 Ironically, by recording “Suede Shoes” as a tribute to Perkins, Elvis might have kept his friend from having a #1 record. Still, the preponderance of evidence reveals that Elvis was not overtly involved in the seedy competitive practice of recording cover records in the 1950s. And he is certainly completely guiltless of throwing roadblocks in front of black r&b singers trying to crossover to the national pop charts in those early years of rock ’n’ roll. "How did Elvis Presley fit into the 'cover' controversy in the fifties? Was he ever guilty of stealing sales, chart placement, and prestige from other singers by rushing out a cover version of someone else’s current hit?"